School started this week, so it’s been super busy at our house. 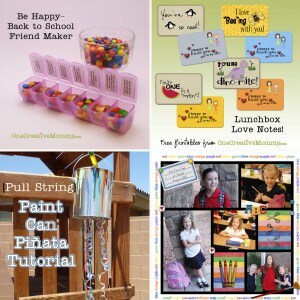 I shared lots of back to school posts and ideas this week. 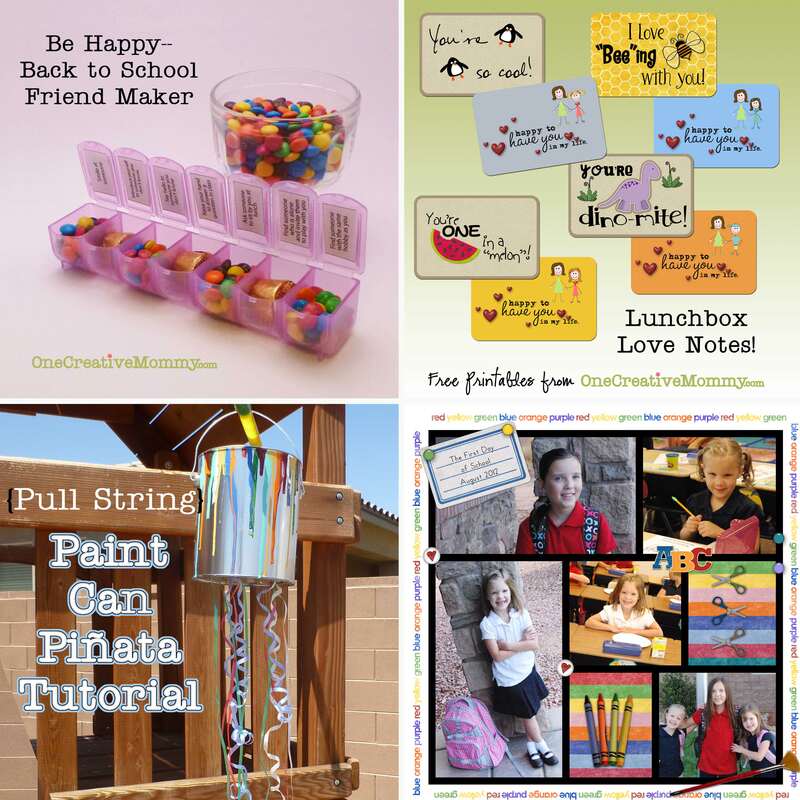 If you are looking for ways to help your child step out of his/her comfort zone and make new friends at school, try my Back to School Friend Maker game. My girls are really enjoying it. Want to send a little love to school every day? Try my Lunchbox Lovenotes! For tips on how to quickly create a back-to-school layout to post on your blog, visit here. And, finally, I’m beginning to have time to work on my Arsty Party posts. Check out my tutorial for a Pull-String Paint Can Piñata. Onto the party! 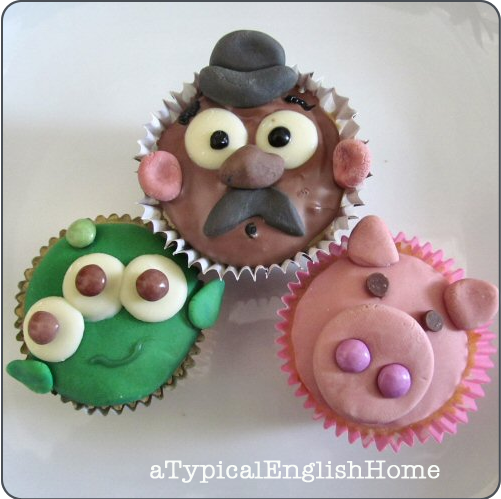 This week’s fan favorite was Toy Story Cupcakes, by Angela at A Typical English Home. Aren’t they adorable? I love that she let her kids make their own. Check out her link to see versions created by the rest of her family. Now for a few of my favorites–I wish I could feature more, but it’s 12:16! The Desperate Craftwives (love that title!) 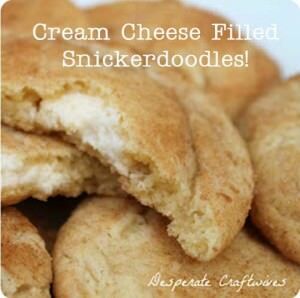 shared this sinful recipe for Cream Cheese Filled Snickerdoodles! I didn’t think snickerdoodles could get any better, but I was wrong! Jessi at Practically Functional shared this awesome Magnetic Spice Rack. I can’t wait to make one. My spices currently reside in several shoeboxes. They are desperate for a new, space-saving home! 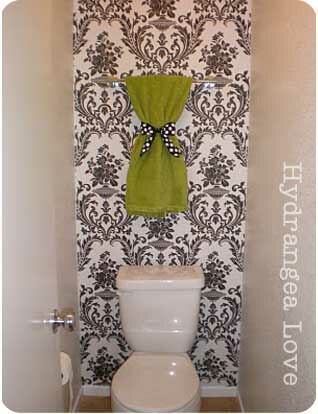 Last, but not least, is this fantastic Water Closet Makeover from Kirstie at Hydrangea Love. I love the colors . . . 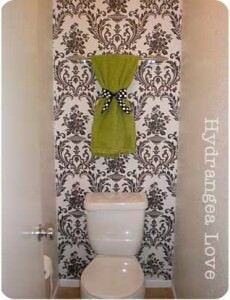 I love the accent wall . . . Fantastic! It’s 12:23, and this post has almost taken an hour! Someone please teach me how to simplify and stop being such a perfectionist! Please!!! Now, it’s your turn! Show me what you’ve got! Thank you for hosting. Have a great weekend! Thanks for visiting! I just liked you on Facebook. Ugh! I know what you mean! I see people who post daily on their blogs and I don’t know how they do it! Cropping and editing my pictures and then reading and re-reading my writing to make sure it is ok…. it takes me forever to do a post! I’m amazed at others who do it so quickly and flawlessly. Maybe practice makes perfect (or faster), hey??? ;) Thanks for hosting! This week I’m going to comment on the posts right away instead of waiting for Thursday night! I think that will help. Nice to meet another perfectionist! Just joined your site. Liked! Oh, my goodness . . . the picture on your facebook header made me laugh! I love it! Thanks so much for hosting this party! Hope you have a fabulous weekend! Thanks! You, too. I just visited you blog, and I’ll be back! Thank you for hosting another link party. So happy to see my Toy Story cakes featured this week! Thanks for the sweet comment you left on my blog and for hosting the party. Heidi, thanks for coming by Quirky Vistas and taking the time to leave me a comment and invite me to the party. Very sweet of you. As for how to take less time doing posts…ha… the last person you would want to give any advice on that is a longwinded, tweak-queen like me. I can’t ever stop tweaking and making changes to posts. It’s a sickness. Thanks for the party and taking the time to make it just right! I appreciate your attention to detail. I’m glad I’m not the only one suffereing from tweak sickness. Too bad there’s no cure! Thanks for making me smile. Gee. You’d think a retired teacher could spell! I mean–suffering! Thanks for hosting! Have linked up my Date Tart for your party, hope you’ll like it.. Thanks for hosting! I am just showing up to the party (a little late) but didn’t have anything new to share until now. Hope your weekend was nice! I’m linking up my latest project! I am getting know-how every day by reading thes good content. Hello, always i used to check blog posts here early in the dawn, since i enjoy to gain knowledge of more and more. tying up capital in commercial real estate property. Another way to protect yourself as a property investor is simply by properly choosing what your company entity should be. (that I still own today) will be worth $170,000 today. actually talking to the women you’d like you could can provide you with insight would you be capable of getting anywhere else. the phone, etc. The bouncer is constructed from interwoven oxford cloth and has an inner membrane for really support.